Tomato Ketchup, Tomato Puree and Tomato Paste are common forms of processing of tomatoes. We offer automatic and semi-automatic plants for tomato processing for the above finished products. The plant includes machines for washing tomatoes, crushing and hot breaking, extracting tomato pulp, vacuum or open kettle concentration, pasteurizing etc. The number and size of machines depends upon the capacity of the plant.Tomato Ketchup is filled in glass/PET bottles. We offer complete filling line including vacuum filling machine, pneumatic crown corking machine, bottle capping machine etc.Tomato Puree is filled in tin cans. 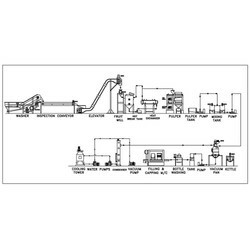 We offer automatic can filling machine, and other can reforming machines. We are offering comprehensive range of Tomato Ketchup Processing Plant, that are used for preparing and packing of tomato ketchup. 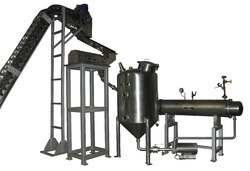 The plant includes machines for washing tomatoes, crushing and hot breaking, extracting tomato pulp, vacuum or open kettle concentration, pasteurizing etc. The number and size of machines depends upon the capacity of the plant. Tomato Ketchup is filled in glass/PET bottles. We offer complete filling line including vacuum filling machine, pneumatic crown corking machine, bottle capping machine etc.